We are excited to announce per-project Insights. 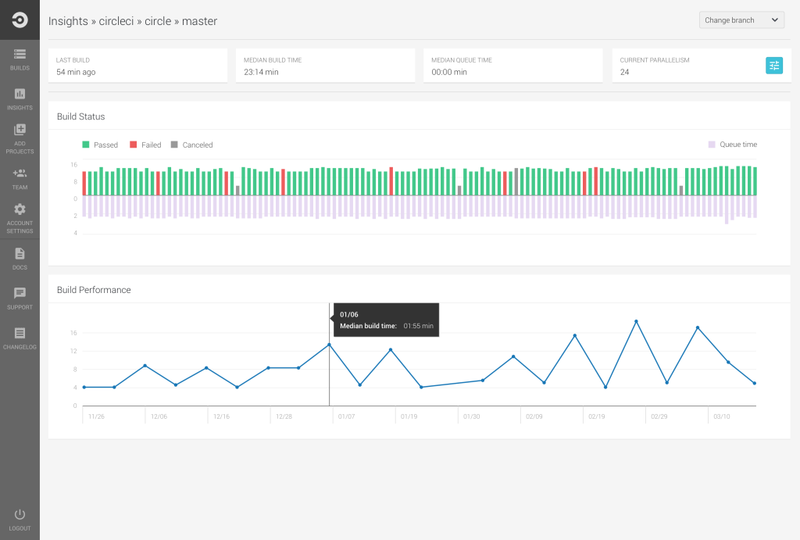 Generally available for all paid and open source customers, CircleCI per-project Insights helps you understand the performance of your project over time. To get started: Click on the new ‘Insights’ icon on the main navigation. Once on the Insights dashboard, you can click on your repo name to access per-project insights. Per-project insights page gives you access to the following two graphs for a selected branch: build status and build performance. **Build Status: **Currently, on the Insights dashboard, users have access to last 50 builds for their default branch. As part of this page, users have an option to pick a desired branch and access over 100 build statuses for that selected branch. Build Performance: Build performance aggregates your build data for a particular day and plots the median for that day going back as far as 90 days. You can now monitor the performance of your repo by selecting a particular branch. We will continue adding functionality to this page and help you optimize your builds. We’re always excited to hear from you. Please feel free to send us feedback at feedback@circleci.com.